As Mac users we have a unique tool in fighting phishing scams ... the mouse pointer. Simply by hovering over a button, or a link found in an email ... you can see the actual URL the link takes you too. The emails like you see pictured come to me about 4 times each day ... since mid 2005 these emails have gotten more and more sophisticated. 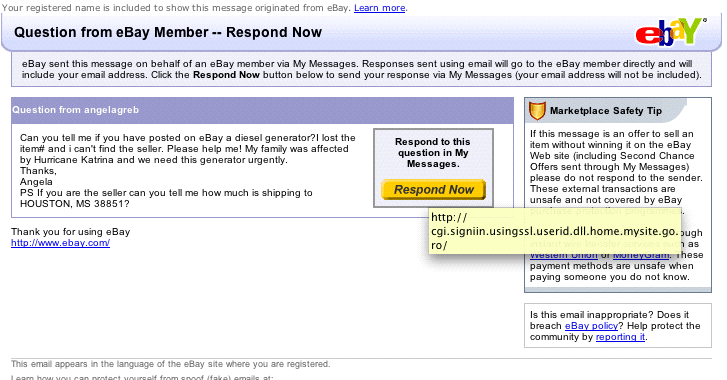 The email above only had one small point on the respond now button that was a "scam URL" ... meaning all other links on the page actually linked to real eBay pages. 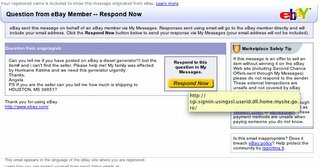 As I have pointed out to you several times before ... NEVER click on an email link ... READ AGAIN ... NEVER click on an email link ... not even if your mother sends it to you ... because ... there is a good possibility that your mother's computer may have a virus or may be passing along spyware. 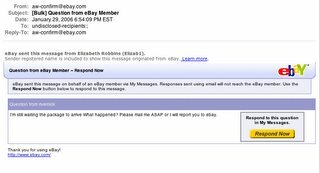 Personally, I don't think eBay is doing enough about this ... there are ways they could work with webhosting companies, Apple, and Microsoft to get rid of the majority of this problem ... much like the printing industry has tried to fight counterfeiting by not allowing printers to print or scanners to copy or scan; US Currency ... there could be some sort of visual filter for email as well. 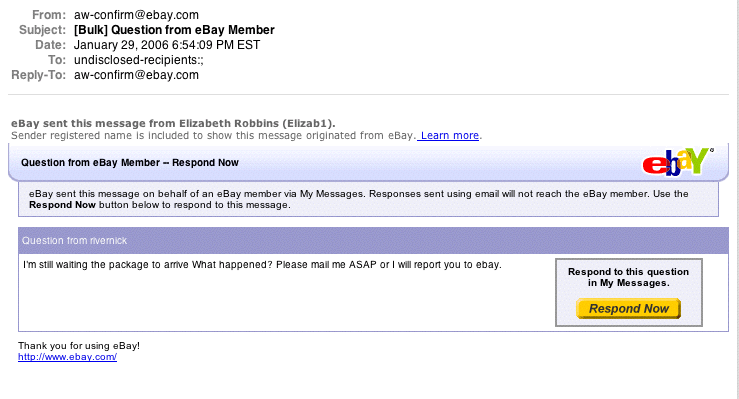 I get a lot of these emails as well.